What a wonderful way to start the week. I was asked to collect a boat from Wigram’s Turn marina at Napton Junction and bring it back to the engineering workshop at the southern end of our Locks marina. The weather was beautiful on Monday. A weak autumnal sun was trying to break through a grey mist over the water. There wasn’t a breath of wind. Just half a dozen mallards disturbing the quiet with their slow mocking quacks and about a dozen juvenile swans gliding aimlessly up and down the canal. Wigram’s Turn marina is less than a mile along the canal from Calcutt but the trip took me just under two and a half hours by the time I had checked an unfamiliar boat and its engine before I set off, cruised along the canal, negotiated the Calcutt flight and then turned into the marina where I moored the boat and shut it down. For the rest of the week I’ve been blitzing the lock cottage garden. The lock cottage adjoins our office, reception and chandlery and is home to marina manager Martyn Tylson and his wife Sue. They’re not really into gardening so the area’s upkeep has been transferred to Calcutt Boats’ grounds team, Pat and I.
Pat has been busy digging a 200m long 12″ deep trench for a new power cable for the moorings above the top lock this week so I’ve had the pleasure of attacking the garden on my own. The garden contains quite a few productive fruit trees. There are apple, pear, damson, cherry and a rather impressive walnut tree. The garden is also home to a rather unusual feature. There’s a full size lock running along the inside of the black and white iron railings which separate the garden from the canal footpath. This additional lock was originally used to weigh cargo carrying narrowboats when they left the Grand Union and entered the Oxford canal. I haven’t been able to find out when it was last operational but it’s probably safe to say that its only use has been as a garden water feature for at least the last century. I’ve now reduced the height and spread of the apple and pear trees, removed a truck full of dead reeds from the lock’s stagnant water, leveled the ground around the lock by removing some rather large ant hills, removed some well established willow from the lock wall, dug out six inches of earth and matted roots to reveal the original brick lock edging, removed half a dozen stands of self seeded buddleia and strimmed the garden to within an inch of its life. The garden looks a little bare at the moment but, if you approach Calcutt Boats from Napton Junction next spring, as you reach the top lock glance over to your left. I’m sure the garden will be a thing of beauty. As you probably know, I had my wooden cabin over plated with steel in November 2011. The original wooden front, side and rear doors were removed, as were the side and rear hatches. The boat was returned to me with new hatches and doors in unlined steel. Bare steel conducts heat out of the boat very quickly so as soon as possible I had the front and the side doors lined with ply and then painted. I didn’t line the doors in the engine room. The original engine room door panels were painted with “roses and castles”. Roses and castles is the name given to the artwork adorning many traditional narrowboats. The panels had suffered irreparable damage after years of water running down them from a warped and leaking hatch so I had to throw them away. No one knows the true origin of the elaborate artwork adorning traditional narrowboats but the practice became commonplace when working boatmen were forced to move their entire families on boat with them as a result of plummeting wages as the canal carriers tried to compete with a rapidly developing railway network and the boatmen’s inability to afford cottage rent. If you think there is very little space to live on a narrowboat these days, spare a thought for the family of an average working boatman on board a narrowboat. The entire family lived full time in the “boatman’s cabin”. This cabin was at the very back of a working narrowboat just behind the engine room and would offer a maximum living space of roughly six feet by ten feet. In sixty square feet the boatman and his wife had eat, sleep and keep all of their worldly possessions. Their water supply was kept in a can on the roof which could be topped up at standpipes along the canal. Clothes washing was done in the canal itself and hung up to dry on a washing line over the cargo area once the cargo had been discharged. Their toilet facility was either a bucket, a convenient hedge or over the side of the boat into the canal. Think about that next time you use a slightly smelly but very convenient pump-out loo. Boating families were looked down upon by the majority of Victorians living in homes on dry land so they did everything they could to smarten up their boats to show the pride they had in their tiny living space. 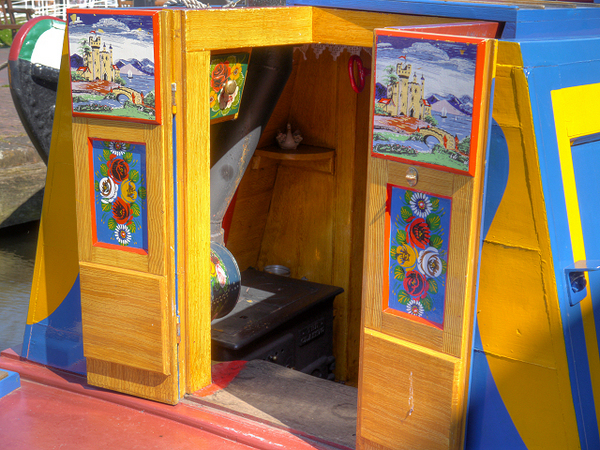 They decorated the inside of the boat’s rear doors then folded them open for the world to see. They painted hatches, poles and planks, water cans, cupboard doors and food bowls. They created intricate crochet lace trimmings, ornamental and practical ropework and added highly polished brass fittings. The more I learn about traditional narrowboats’ decoration, the more tempted I am to add as much as possible James. I have to be practical though. Although James is thirty six years old, the boat doesn’t have the traditional engine room/boatman’s cabin layout so much of the old canal art would just look out of place. I’ll have to stick to a couple of rather fetching rear door panels. Shortly after the boat was delivered back to me after the new steel shell was added I asked Mel Jeffs, wife of our carpenter Roger at the time – now retired an living an idyllic existence as a continuous cruiser – to paint some canal art on my new rear door panels. She agreed, and she made an excellent job of it. Unfortunately they didn’t end up on my boat at the time. I don’t know what went wrong. It was a classic case of miscommunication. Mel finished painting the panels for me at the same time I left the marina to visit my family in Australia for two weeks. As soon as I returned to work I asked her husband Roger if the panels were ready. He said that they had been ready for two weeks but, because I hadn’t paid for them on time, Mel wasn’t happy to give them to me. I don’t know who to blame for the misunderstanding. I suspect we both had a hand in it but the end result was that Mel kept the two panels on their narrowboat, Beam. Time passed, Roger retired from Caluctt and the pair left the marina to realise their lifelong dream of cruising the network. As the couple left, so did my chances of getting my hands on the beautifully painted door panels. Earlier this week I spotted Beam moored near Caluctt Top lock. Later in the day I spoke to Roger when he walked his dog past where I was working in the cottage garden. Coincidentally, a few days earlier I had asked another retired carpenter who moors at Caluctt to fit some door panels for me. The panels had been decorated by a well meaning but inexperienced budding “artist”. To tell you the truth the end result looked like an accident with half a dozen yoghurt pots. I was keen to have the panels fitted to help retain the heat and combat the draught in the engine room but I would have probably painted over the artistry. So I was delighted to see Roger and delicately touched on the subject of the panels his wife painted two years earlier. He had good news and bad news for me. The good news was that he still had them, carefully wrapped in a spare dog blanket and stored under their dinette table. The bad news was that, just four days earlier, they had offered the two door panels for sale on eBay. Roger agreed to speak to his wife to see if she was (A) prepared to sell the panels to me after our previous misunderstanding and (B) withdraw the listing from eBay. I saw Roger again the following morning. Mel was happy for me to take them off her hands so, as there had been no bids placed, she had already removed them from the auction site. I paid her as soon as could race back to James, find £120 in cash and hurry back to Beam. The panels are now mine, and I am absolutely delighted with them. They are as good as an example of traditional narrowboat art as you will find anywhere. The photograph below is of a traditional narrowboat at the National Waterways Museum at Ellesmere port. The photo above is of one of my own door panels. As you can see, both panels have the traditional romantic “castles” scene on a raised panel at the top, the “roses” art on a sunken panel in the middle and a lower blank panel. I’m going to have the panels fitted next week. I can’t wait to get out on the cut and casually pin the doors open when I’m moored up to show them off. I would have liked Mel to paint panels for the two pairs of side hatches too, but I don’t think that’s going to happen. I told her that I was going two write about her artistry in this week’s newsletter and asked if I could publish her contact details for anyone who was interested in asking her to paint for them. Mel explained how difficult it is to paint the panels on a narowboat where two people and a rather large and clumsy rottweiler are living full time. They could just about manage it when Roger was away at work for five days a week but since he’s retired having freshly painted panels dotted about the boat just isn’t practical. Maybe I’ll just have to ask young Stuart to refine his yoghurt pot approach. I’ve been champing at the bit to record my first video. I was waiting for a mini tripod for the camcorder before I could start. The tripod arrived on Friday. Circumstances have conspired against me since then. There was a question asked on the forum a few days ago about the practicality of downsizing from a house to a boat. I thought that a quick video about a narrowboat’s internal storage space was in order. Sally persuaded me otherwise as I set up the camcorder. “What are you doing?”, she asked suspiciously. I told her. “You must be joking! The boat is a mess.” I disagreed. I think we have a very tidy boat. I disagreed until Sally pointed out that she had just done the washing. Sally works long shifts as a carer at a nearby nursing home. She had just worked forty eight hours over four days and now had three days off. On her days off she’s like a whirlwind going through the boat. She uses some of her free time getting the washing done. The twin tub does a pretty good job of washing and then spinning the water out of the clean clothing but it then needs to be hung up to dry. There’s very little space to hang anything out of sight on a narrowboat, so the washing is usually hung from the curtain rails near the fire for twenty four hours. Sally had been working the twin tub to death ffor a full day before my intended video session so there was washing hanging everywhere. I could see her point. Sally is also in the process of sending one of her regular tea chest sized packages back to her family in the Philippines. They don’t have much money for anything else other than food, so Sally does what she can to make life a little easier for them. Old clothes and unused electrical devices, mismatched sets of crockery and cutlery, battered old shoes… Anything which could possibly be of use is packaged and dispatched. My planned video session coincided not only with Sally’s mission to rid the boat of dirty clothes, but also with one of her let’s-get-rid-of-everything-you-don’t-wear sessions. There were piles of old clothing everywhere. I had to agree. It wasn’t the best impression we could have given of a tidy and organised boat. I was still determined to make a video for the site. If I couldn’t use the camcorder inside, I would have to take it outside instead. I need to make an introductory trailer for both the site and for my new YouTube channel. I thought the perfect location would be standing on the grass covered peninsula next to James, overlooking the marina and with a scenic view of James on its mooring. I spent ten minutes experimenting yesterday before I gave up in frustration. Yesterday was very windy, especially around midday when I foolishly tried to use my lunch break from work to do the recording. The tripod was promptly blown over. I weighed it down so it wouldn’t move and recorded for five minutes. Back on the boat, I played the video back. It was hopeless. I couldn’t hear a word I said over the exaggerated howling of the wind. Still, Rome wasn’t built in a day. Sally’s back at work for four days from tomorrow. I’ll have the boat to myself so I’ll upload the first of the videos by mid week. Please do me a favour though. If you see any items of intimate apparel hanging to dry in the background don’t tell Sally. That’s interesting about the lock in the garden. I’ve been through Calcutt many times and thought you were talking about the old narrow lock alongside the existing lock but having looked on Google Earth and Bing I can see what you are talking about. The Google pictures show how overgrown it has become. The narrow lock beside the current double double lock was the original lock before the the double locks were added in the mid thirties. Yes. You can see them besides most of the wide locks all the way from Calcutt to Knowle. Most of them are used as overflow weirs now.